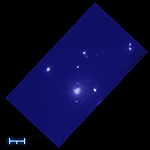 3C295 (Cl 1409+524) is one of the most distant galaxy clusters observed by X-ray telescopes. 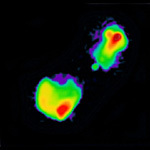 The cluster is filled with a vast cloud of fifty million degree gas that radiates strongly in X rays. It has a redshift of 0.461, which means that we see the galaxy cluster as it was 4.7 billion years ago. 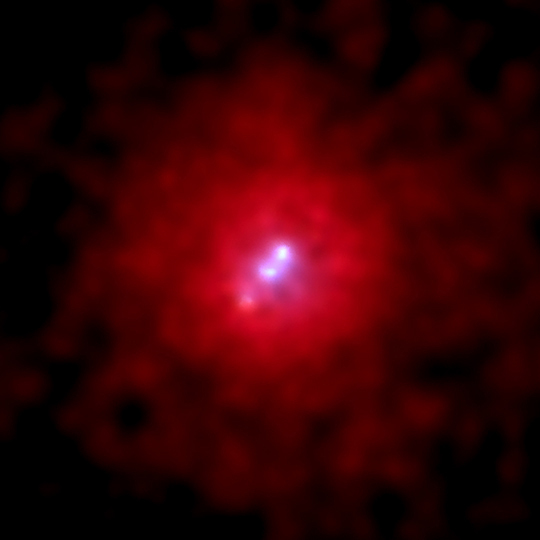 3C295 was first discovered as a bright source of radio waves. The source of the radio emission was found to be a giant elliptical galaxy located in the center of the cluster of galaxies. Chandra discovered that this central galaxy is a strong, complex source of X rays. Scale Image is 42 arcsec across. Coordinates (J2000) RA 14h 11m 20s | Dec -52° 12' 21"